A few years ago I was headed out on a long road trip and grabbed several CDs from my collection as "music for the road." Yes, it was CDs at the time. I had not yet made the leap to an iPod that allows one to take almost all of their musical collection along for the ride. I loaded the multi-player with the maximum six CDs and started out. A few hours into the drive I realized that five of the six albums I had loaded into the car stereo had a direct connection to Wayne Kirkpatrick. You may not think you know this name but chances are you have heard his music. Wayne Kirkpatrick is a singer songwriter with an extensive collection of songs he has written. Most of his songs have been recorded by other performers and the list of those who have used his songs is very impressive. He co-wrote the Grammy award winning song "Change the World" with Gordon Kennedy and Tommy Simms which was recorded by Eric Clapton (1996)1. He received a Dove award for producer of the year in 1994 2 and his songs have been recorded by an eclectic group of artists: Garth Brooks ("Wrapped Up In You" and "You Move Me"), Susan Ashton ("You Move Me," "Blind Side," "Body and Soul," "Crooked Man," "Spinning Like a Wheel," "Lonely River," and "Love Profound") Eric Clapton ("Change the World"), Garth Brooks in his Chris Gaines persona ("Lost In You," "It Don't Matter to the Sun," "Unsigned Letter," "Main Street," "White Flag," "Digging For Gold," and "My Love Tells Me So"3), Faith Hill ("Love Will Always Win"), Amy Grant ("Lead Me On," "House of Love," "Lucky One," "Takes a Little Time," and "Straight Ahead"), Martina McBride ("Anything and Everything"), Trisha Yearwood ("Love Will Always Win"), Little Big Town (all songs on the "A Place To Land" album and all but one song on the "The Road To Here" album), Kathy Mattea ("Grand Canyon"), Wynonna Judd ("What the World Needs Now is Love"), Bonnie Raitt ("Silver Lining" and "Slipstream"), Casting Crowns ("God is With Us"), and Michael W. Smith ("Place in This World" which won a Dove award for song of the year)4. Have I convinced you that you should know this man? Despite all of the success and awards, Wayne Kirkpatrick remains relatively unknown. He is the man behind others; the man in the wings. If you saw him back-stage and asked him who he was he might simply answer with the title of a song he wrote for Little Big Town . . . "I'm With the Band." Few speak of the genius of Kirkpatrick. Paul Zollo's massive book, Songwriters on Songwriting 5 makes no reference to him. It would seem that Kirkpatrick is quite content to be the man in the background and leave the lime-light of performing and the fame of song-writing to others. One of the best ways to get to know the man behind the mystery might be to simply listen to the music he has written and particularly the songs he has saved for his own performances. See if you can find his little known album "The Maple Room." Wayne Kirkpatrick wrote, produced, and performed the songs on this album (released in the year 2000). The songs offer us a window into the life of this amazing songwriter. The liner notes for the song "Window In That Wall" offer this explanation about the song: "I've never been able to put a face with this song but I feel as though I have come in contact with this person. Sometimes I wonder if I wrote it about myself." The lyrics to the tune follow. Ah, there we have it, the self-isolated artist who has created a fortress to guard his soul. Yet, he will give us a window that allows us to see inside. His music, his lyrics, his art are that window that allows us to get to know this man. I encourage you to get to know Wayne Kirkpatrick. I leave you with one last thought. The first page of the liner notes for "The Maple Room" contains a few words from Vincent Van Gogh. ". . . I want to progress so far that they will say of my work: he feels deeply, he feels tenderly - notwithstanding my so-called roughness or perhaps even because of it." These are worthy words by which we all might live. I saw Jesus on the train today. He looked right through me with a piercing stare. I didn't expect him to look that way. He asked me to love the people on the train. I saw Jesus on a screen today. His tear filled eyes in Somalia. He's asking me to give it all away. To be his hands in a broken place. I saw Jesus in the clouds today. He was coming with a trumpet and a shout. How was I to know time was almost out. He asked me if I had loved the people on the train. In Douglas Wilson's introduction to the book Is Christianity Good For the World: A Debate, Christopher Hitchens and Douglas Wilson, Wilson has this to say. God knew that we were going to need to pick up dimes, and so He gave us fingernails. He knew that twilights displayed in blue, apricot, and battle gray would be entirely astonishing and beyond us, and so He gave us eyes that can see in color. He could have made all food quite nourishing, but which tasted like wadded up newspaper soaked in machine oil. Instead He gave us the tastes of watermelon, pecans, oatmeal stout, buttered corn, apples, fresh bread, grilled sirloin, and 25-year-old scotch. And He of course knew that we were going to need to thank Him and so He gave us hearts and minds. The issue of thanksgiving is really central to the whole debate about the existence of God. On the one hand, if there is no God, there is no need to thank anyone. We are here as the result of a long chain of impersonal processes, grinding their way down to our brief moment in time. If there is a God, then every breath, every moment, every sight and sound, is a sheer unadulterated gift. And, as our mothers taught us, when someone gives you presents like this, the only appropriate response is to thank them. Anyone who has read a few postings on this blog site will likely know me well enough to know that I don’t think these words by Douglas Wilson are the final word on the existence of God. It is an awesome way of describing the fitness of humans for this planet on which we live; but of course my atheist friends will readily point out that there are other explanations. One can argue that the nature of this planet defined that the fittest beings for existence on this planet would have to develop colour vision that could distinguish bushes from predators crouched in the bushes. Therefore, those with colour vision survived. You could argue that we evolved a set of taste-buds on which food that is good for our bodies and good energy for storing up fat, tastes good to us. Bad food that is poisonous or unhealthy could taste like "wadded up newspaper soaked in machine oil." But I do like an explanation that leaves room for a God who simply loves his creation and wants to give good gifts to human and beast. And the explanation that God allowed us to evolve this way, and indeed, saw that we would evolve this way, also leaves room for a mechanism of fitness to guide the process of how we became what we became. A God who exists is also a great recipient for our thanksgiving. I often feel sorry for people at the holiday season known as Thanksgiving. Some celebrate the earlier Canadian Thanksgiving in October; others, the later American Thanksgiving in November. To whom does the atheist turn to give thanks? As Wilson says, “If there is no God, there is no need to thank anyone?” Oh sure, you could thank your forefathers and foremothers for outrunning the predators so that they survived long enough to reproduce and ultimately brought you into this world. But that seems rather hollow when really the only thing we can say about our ancestors is that they were the previous sac of bio-chemicals that managed to achieve rational thought. I am glad to have a God whom I can praise and thank. It is an appropriate response for this amazing planet on which we live. Proverbs 6:23 says, "For these commands are a lamp, this teaching is a light, and the corrections of discipline are the way to life . . . ."
Yet, at the time, correction never seems like the way to life; it seems like the way to discouragement. Harold Bullock has this to say about how we might handle those who come to us with correction. When someone offers you a correction, you feel a need to defend yourself. You will be inclined to make statements that show your irritation or try to immediately explain why the correction is not really applicable to you. However, immediate self-defense usually shuts down the person trying to offer the correction - actually that is probably why we react defensively in the first place - to shut them down! Instead of rushing to your own defense, calm down and explore what the other person is saying. Remember, we tend to be innocent in our eyes. So explore. Ask, "How did I do that? When did I do it? Where do I do it?" Ask clarifying questions until you really understand what the other person is saying. These are definitely words that I need to keep close by for when a friend corrects me. It is never easy to accept criticism and yet everyone of us needs such correction. The correction we receive is a great reward to our lives. "Like an earring of gold or an ornament of fine gold is a wise man’s rebuke to a listening ear." - Proverbs 25:12. *Bullock, Harold. Sharper Strokes: Living Smarter . . . Not Harder. Fort Worth: Golden Oak Publishers, 2003, p. 227. I wear a cross around my neck. I wear it underneath my shirt and most people will see no indication of the fact that I wear it unless they see the string at the back of my neck or a small wrinkle on the front of my shirt. 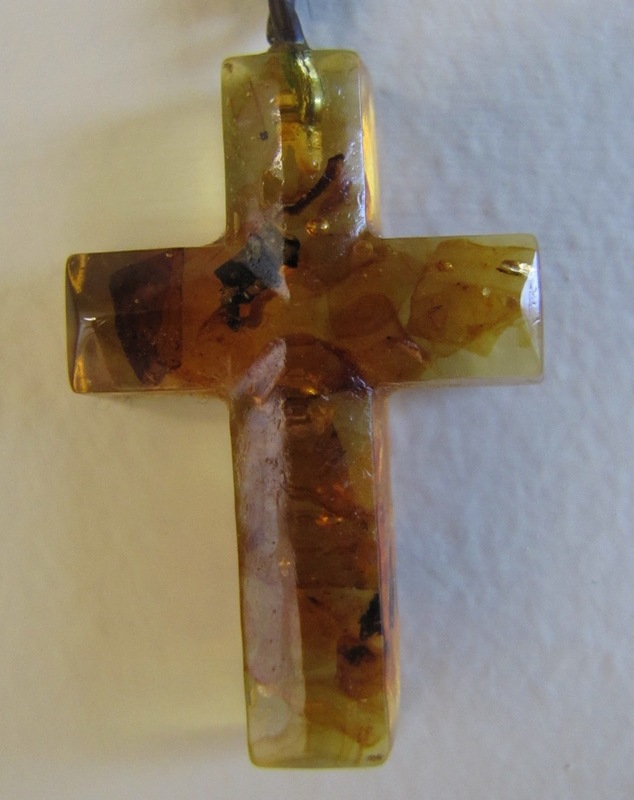 The cross was carved out of amber by a Polish jewellery maker. A friend brought it back from his trip to Poland and gave it to me and I have worn it for the past ten or more years. 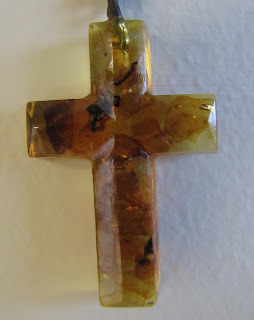 Amber, for those who don't know, is fossilized tree resin and is quite hard and contains many inclusions. Bits of vegetation or insects are often trapped in the resin before it goes through its polymerization and fossilization process. In the picture (click on it for a larger image) you can see the inclusions and imperfections of the amber. I like wearing this imperfect cross that is full of dirt and plants and other things. It reminds me of a few things. First, it reminds me that I am imperfect. I am not a shiny piece of gold without flaw. I am more like this amber in that if you could see through me you would see my sin, my darkness, and my flaws. This is at the heart of why we need the sacrificial death of Jesus that was accomplished on a cross. Secondly, it reminds me that crosses are not the beautiful things that we often make them to be in our church buildings and in the jewellery worn around our necks. The cross on which Jesus died would not have been a perfect, symmetrical, cross of oak finished with stain and lacquer. It would have been rough, splintered, wood that had been picked up from a trash heap because it was not good enough wood to be used anywhere else. Who knows how many others might have died upon this cross before Jesus was hung upon it. The God-man, Jesus, was willing to be humiliated by a rough piece of wood that added further gouges to his already damaged body to show his love for all humanity. I wear the cross underneath my shirt and it reminds me every day that my interactions with those around me must reflect this sacrificial love to others. I used to spend a lot of time wishing I had someone else's life. I used to dream of being a rock-star, a singer songwriter, an astronaut, a theologian, the pastor of a mega-church, a scientist, a leader of leaders, an author, a pastor of pastors, a teacher, an academic, a denominational executive, an artist, an actor, a photographer, . . . . In later years I have met rock-stars, singer songwriters, theologians, pastors of mega churches, scientists, leaders of leaders, authors, pastors of pastors, teachers, academics, denominational executives, artists, actors, photographers, . . . . I don't think I have ever met an astronaut but I read Neil Armstrong's authorized biography and that cured me of wanting to be an astronaut. For some periods of my life I have actually had the opportunity to do some of these things on my list of jobs I wanted to have and people I wanted to be. I have discovered that the lives of these other people are not as glamorous as I thought they might be. Actors, singers, and rock-stars speak of the treadmill on which they find themselves. They must always look over their shoulder because there is always someone coming up behind them who is younger, better-looking, or a better singer who is seeking to take their place on the hamster wheel of fame and fortune. Most of these people also dream of being something and someone else. Some of these people I have met have actually wished they had my life. What madness is this that overtakes us all! I lamented to my theologian, pastor, scientist friend (yes, he is all of those things rolled into one career) that I felt I had never done anything significant in my life. He shocked me when he said that an hour ago he had been lamenting the same thing. Why can't I be content with my lot? What drives me to always want to be someone else? How can I keep learning how to be content in all things? How can I keep learning to be the person God made me to be? As I was heading out to catch the train at 8:00 am on Friday morning I saw the grey skies and knew that many people would be down. We Vancouverites love to complain about the weather. But then God hit me with the sense of how I first saw Vancouver when we used to visit from Calgary. I was always struck with how humid the air was and how good it felt in my lungs. You can see what you are breathing here (in a good sense), you can taste it, and it feels good on asthmatic lungs. I looked at how green the grass was in March. I spotted the new blossoms of the rhododendron hedge in the courtyard across from our place. I walked past crocuses and snowdrop blossoms and heard finches twittering in the trees. I thought of places still blanketted in snow or hitting low temperatures and reminded myself I was outside in a light wool jacket without a hat, or gloves, or boots. It is all about my perspective. I need to watch for God’s perspective and His presence. See also this blog by Aaron Etheridge. Paul Tillich, an influential theologian (1886 – 1965), wrote these words in his book, The Dynamics of Faith (1957). He is reminding us that faith often has an element of doubt. People I have met are often scared of such doubts. Some put off or never make a decision to look into spiritual issues because their doubts about God, Jesus, or the Bible get in the way. I usually counsel people to embrace their doubts as a healthy part of their faith. It makes them more honest with God and with other people. Doubt can drive us toward truth. I would also add that doubt keeps us humble. The book of Proverbs in the Bible has many reminders that humility and wisdom go together. Proverbs 11:2 says that with humility comes wisdom; Proverbs 15:3 and 9:10 teach that respect for God is the beginning of wisdom and that humility comes before honour. In the contemporary debates of the new atheists and those who argue for God, or the latest arguments concerning creation and evolution, what is often lacking is a healthy sense of doubt and a healthy sense of humility. There are few things more foolish than a person who presents herself or himself as having all of the answers and no doubts. This is equally true of atheists and theists of all types. No one has a complete grasp of any subject. We need each other and we need to be willing to learn from each other. Today, let us sing a song of praise to doubt. Let us learn from our doubts and may our doubts drive us ever closer to truth. Who is wise and understanding among you? Let him show it by his good life, by deeds done in the humility that comes from wisdom. - James 3:13.